CLAMP will be guest artists in Minoru Toyoda & Kumichi Yoshizuki‘s doujinshi Koukan Nikki (交換日記, Exchange Diary). 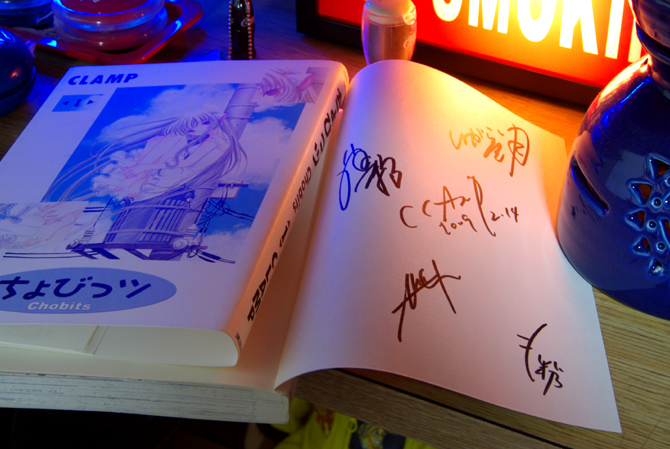 Apart from CLAMP, the doujinshi will have other 4 guest artists. The 68 page, B5 format doujinshi will be sold for 1000 yens at the 79th edition of Comiket (Dec. 29~31). This is the first time in a good while that CLAMP collaborates for a doujinshi. The news came from a message posted in CLAMP-NET.COM by Nanase Ohkawa. That’s so sweet of them :3 It’s great to see they still have a connection with the doujinshi industry despite their overwhelming popularity. Thanks for the news! Yeah, it’s CLAMP back to basics =) I’m sure they must have had loads of fun. Here’s hoping new collaborations will popup eventually! Yuuto-san, are there any bits of info you could get about CLAMP’s opinion on the “Law of non-existant youth”, AKA “Anti-otaku Law” or “Bill 156”? Also, it’ll be featured on Comiket in case it’s not cancelled. There’s a huge struggle going on between the editors and Tokyo metropolitan government right now. You can go over to my site to get a brief summary of the situation. I’m a little worried about it =/ let’s hope Comiket won’t get cancelled.